Pia and her husband/mate, Dragos are both shifters. Dragos is very powerful dragon and leader in the shifter world. A freak accident leaves him with amnesia and no memory. He has no idea who he is, only that he was just attacked and injured. This is a tricky personal and political situation, and Pia needs to step in and save the day. OK, a long time ago (2011, I believe) I read the first book in this series, Dragon Bound and I LOVED it! I loved it in that obsessive way where you try to convince all your friends to read it because it’s so awesome and not quite like any book you’ve read before and it just makes you feel gooey inside. And then along came book 2, Storm’s Heart. For whatever reason, I decided to listen to it instead of reading. And I really didn’t like it. I quickly grew frustrated with it and didn’t even finish it. I moved on with my life and was a little sad that such an incredible first book had such a sophomore slump to follow it, but there were plenty of other books to be read. Over the years I was aware that other books came out in the series, but I didn’t pay much attention. I thought now and then that maybe I should give it another try, but I never acted on that until I saw this novella about PIa and Dragos! Hooray! I’m in! I was a bit surprised when I checked in on Goodreads and saw I’d missed another Pia and Dragos book and a novella right before this one. Sheesh. I wondered if I’d even be able to keep up. But I really had no problem jumping right back into things. I think this book would stand alone, even without reading Dragon Bound. My memories were hazy, but it still worked for me. Dragos is powerful, and with only fundamental memories he’s very vulnerable and dangerous. 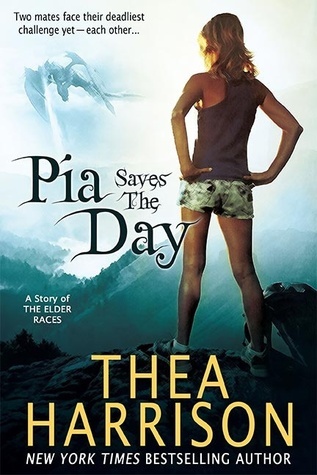 Pia is determined to help him, even if he can’t remember her. It’s a great story. It’s even sweeter when Dragos falls in love with Pia again and finds himself jealous of the original Dragos! It’s a quick, sweet, hot read I highly recommend – and now I want to go back and read the whole series again! Have you read this Elder Races series? Are you a dragon shifter fan? If so, any books to recommend? Oooh. I must start this series! Now!